In 1859, The Reverend David Abraham Herschell, while an assistant to his brother , Rev Ridley Herschell at John Street, Edgware Road decided he should seek his own congregation away from his brother. David Herschell was originally born into a Jewish family from Eastern Prussia , a number of whom converted to Christianity. After completing his studies in Basle he worked as a missionary to the Jews in Liverpool until 1852 when he moved to London to work with his brother. “If you will stand a hansom I will drive you to such a spot” They drove to a spot just past the Green Man on Coldharbour Lane just east of the junction with Loughborough Road surrounded then by fields on all sides. His followers in London raised £740 by subscription to assist in this project. The friend, Mr CT Mason who first suggested the idea of Rev Herschell having his own ministry agreed to be Treasurer and the fund-raising began. The foundation stone was laid on May 22, 1860 by Mr John Cunliffe. The plans called for a chapel for 480 persons, with a school and a vestry seating 200. The church was opened on May 22, 1860 but not constituted until January, 1861. The architect was WG Habershon who was a local builder/developer also responsible for building the Milkwood Tavern and much of the Milkwood Estate. According to the Survey of London, volume 26 the church “was a plain building built in grey brick with stone dressings and designed in a quasi-Norman style. It had long lancet windows at the sides and a large wheel window set in the north front” and “the entrance porch is in the centre of the north front” Opposite the entrance to Loughborough Junction Station. 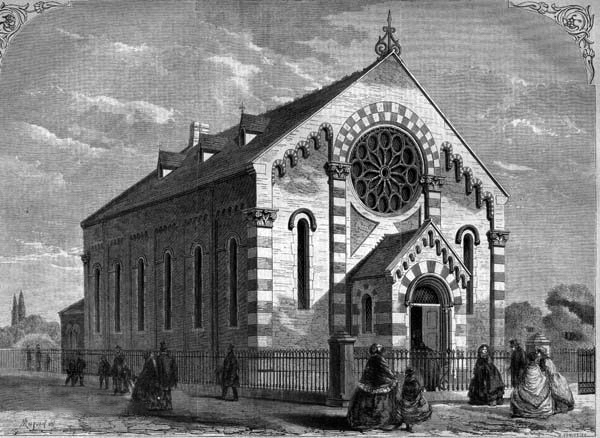 Pictures of Loughborough Park Congregational Church are not easy to find, however there is this picture titled The Chapel for Converted Jews, Cold-Harbour Lane from the The Building News, April 26 1861. This is one of the original drawings by W.G.Habershon the Architect. 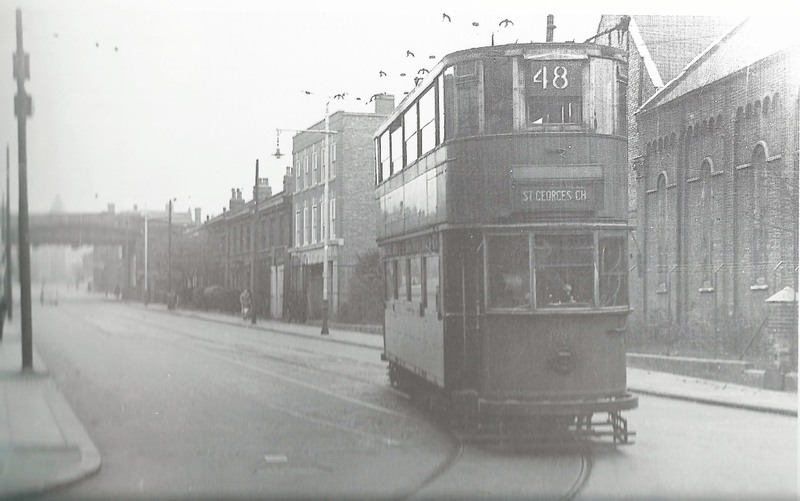 The church stood on the corner of Herne Hill Road and Coldharbour Lane. 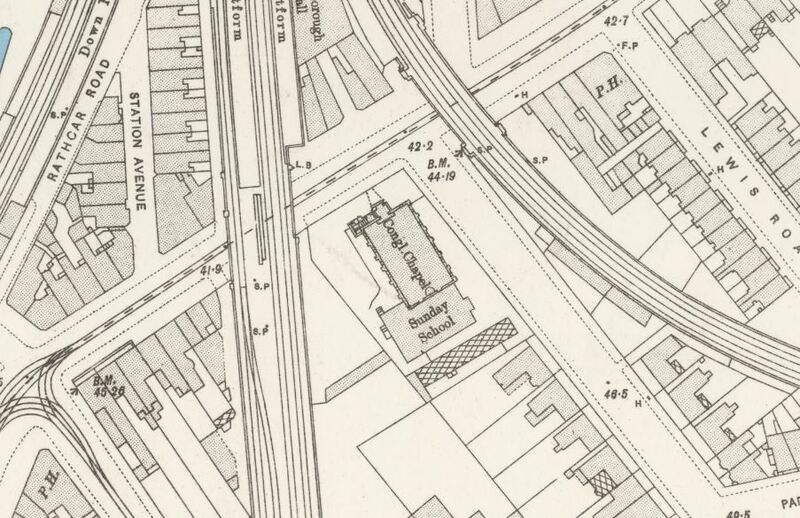 Here it is shown on the OS map of 1893-96. Over the next 30 years many changes were made, more school accomodation was added in 1862. Another story also added in 1862 and a new roof added with walls strengthened and a new staircase built. When the church was built, nobody expected the railway to come through so close to the church buildings and compensation was sought because of continuous noise. £100 plus use of some of the railway arches was accepted. After the freehold of the church was purchased for £550 additional compensation of £50 was offered by the railway companies. In 1866, the mortgage was paid off, an organ purchased in 1869. In 1880, the church was badly damaged by fire and this was an opportunity for extensive alterations. A gallery was added and a tower was built. Postcard Loughborough Junction S.E.No 1 Albert Flint, postally used June 1905. 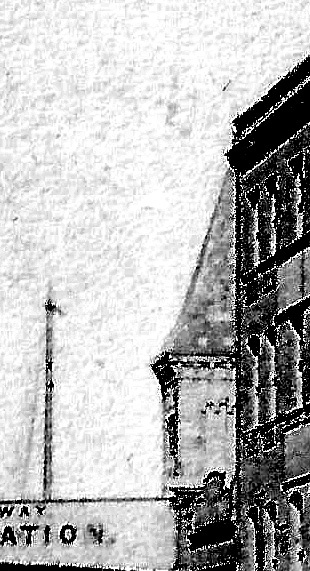 The tower was sited at the northwest corner of the church and is capped by a sharply-pitched type slated roof. Again, from the Survey of London. 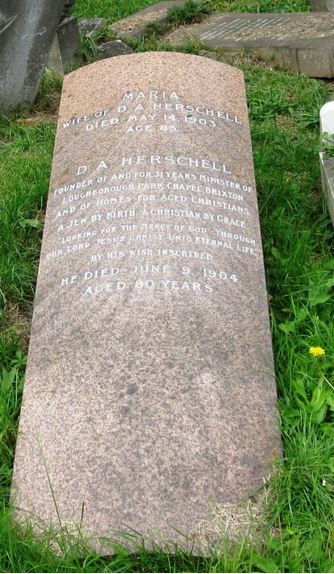 Rev Herschell remained a minister at Loughborough Park Chapel for 31 years. He retired in 1891 and lived on until 9 June, 1904 aged 81 years. Photo taken by Philip Walker and published on his blog http://www.jewisheastend.com. Phil passed away recently. His blog is a fascinating journey through Jewish London and I am only sorry I discovered it too late to go on one of his guided walks. My condolences to his family. There followed a succession of ministers over the next years , firstly by his assistant Rev. JA Joyce till 1892, Rev WJ Adams until 1893, then Rev. TF Touzeau until 1904, followed by Rev. John Thomas Peace of Cardiff. The church continued on for many years, though information is very difficult to find. It was bombed during WW11 with severe damage. The congregation made the journey up Herne Hill Road to services at Herne Hill Congregational Church now the United Reform Church. It was used as a storage warehouse for a number of years before it was demolished. This photo taken by John H Meredith in summer 1951 shows the Herne Hill Road side of the Church with wire fencing keeping trespassers out. Here is another view of the Church spire taken from Loughborough Junction train station signal box further north in 1954 by RC Riley, from Holborn Viaduct to Lewisham by Vic Mitchell and Keith Smith published by Middleton Press in 1990 (added July 2018). 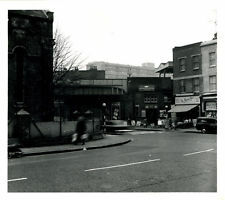 This photo – a view across Coldharbour Lane looking toward Loughborough Junction station, was taken in the early 1960’s. Photographer unknown. Was for sale on ebay in July 2015. Shows the abandoned Church still with it’s wire fencing. Another view of the Church tower in the background from this AFC postcard. Mrs Lucy Newton owned the Chemist between 1912 & 1917 shown between the the two shops with awnings on the north side of Coldharbour Lane with Pomfret Road on the right. The Building News , April 26, 1861 issue. This entry was posted in Churches, Loughborough Park Congregational Church and tagged Church, Coldharbour Lane, Herne Hill Road, Loughborough Junction. Bookmark the permalink. Please contact me. I have information on the organ installed at Coldharbour Lane Congregational Church in 1903, largely undamaged by the blitz, and transferred to Gerrards Cross Congregational Church in 1946. It was later moved to the new Gerrards Cross building in 1980-1982 and is still in regular use. Thanks Guy, for your information. A new post is underway and I will post soon. Rev W.M Carrington from 1912. Rev E.Scott, he died 1927. Rev William South from Oct 1927. There is a press report dated 7th August 1926 about a large notice outside stating that unless £1000 is raised by September 30th then the church is to be demolished. The Tower was shorn up with haulks of timber and the L.C.C had served a dangerous structure notice. Thanks Cal, Very useful information, I will incorporate it into my new LPCC post. Can you identify the Newspaper the 1926 report was in. Hi. I was watching a nineteen fifties film with Jack Hawkins called The Intruder. About three quarters of the way through there was a street shot. The bridge says Loughborough Junction on it and as I have lived there it all looked very familiar except for the church. You have now confirmed that a church did stand at the bottom of Herne Hill road. The shot clearly shows the church if you’re interested.